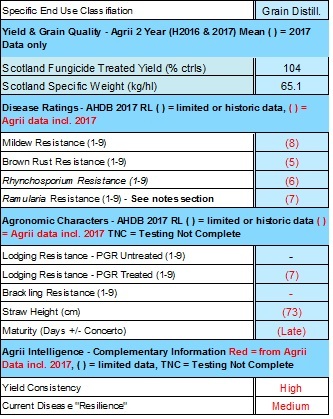 6% higher yields in Agrii trials than Concerto and excellent untreated yields, it continues to perform well both in Northern trials and more importantly, on-farm. It has backing for distilling in Scotland with good grain quality, low grain nitrogen and very high spirit yields equivalent to those of Concerto. The contract tonnage has increased significantly over the past two years. Slightly shorter than Concerto with better standing and Brackling resistance and similar maturity. Very robust and able to withstand the vagaries of the Scottish climate much better than Odyssey. Hindsight has proven that Chronicle is the better of the two but too late for it to become a significant variety for the open market. Excellent physical grain characteristics. Good disease resistance with an improvement over Concerto on Rhynchosporium and Ramularia that helps to prolong green leaf retention. Its only weakness is Brown Rust which is normally less of an issue in Scotland unlike Ramularia which is becoming increasingly important. Four years ago Chronicle appeared very clean of sooty moulds, a big issue for several other varieties including Concerto and this attracted a key maltster to it.